GORGEOUS!! 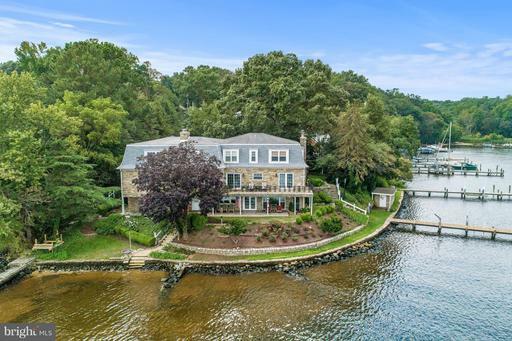 STONE WATERFRONT WITH PANORAMIC VIEWS WELL PROTECTED BY JETTIES , YET JUST 8 STEPS TO THE WATER ON THE SEVERN RIVER! 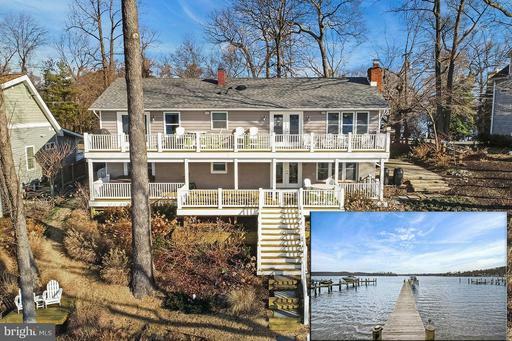 Come home to the sweet spot on the Severn River with a PRIVATE PIER, 10-ft DEEP WATER and 200 feet of rip-rapped water frontage. Inside, gleaming hardwood floors, fresh paint, new carpet and all upgraded Kitchen and Baths make this home like new. Amenities include a secondary entry, main level bedroom/study option, Brazilian hardwood floors, and spectacular water views at every turn! Enjoy the majestic views from the waterside balcony, and from the inviting walk-out lower patio that draws you to the private dock just eight steps away! Lifestyle options are flexible and endless here offering a private rear entrance to the lower level recreation space, a SECOND waterside kitchen fully equipped with stove and range hood, plus a waterside breakfast bar, full bath, two large storage rooms, and full daylight windows! 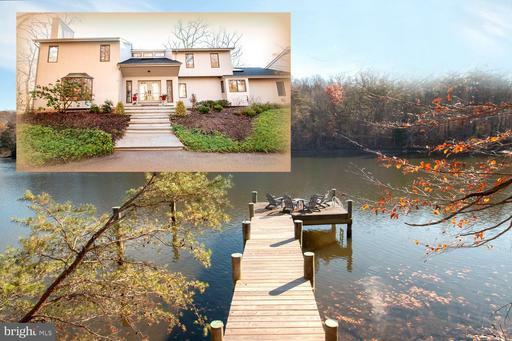 Decompress every day with a very special lifestyle on the water at 1162 Hayman Drive! 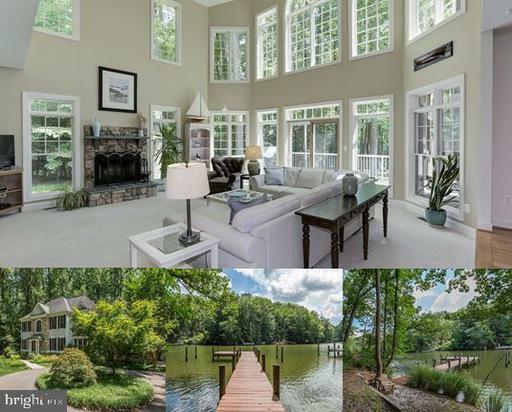 Architectural Showcase overlooking private pier off the Severn River! Inspired design carved into 1.89 treed acres. Soaring spaces spilling out to waterfront deck for dining/entertaining beneath Bay sun and stars. Urban textures of rich woods, glass & granite. Hand-forged light fixtures. 3 distinctive fireplaces. 2-story Living Room. Chef~s cooktop island Kitchen. Glass encased Master Suite surrounded by water. Spa Master Bath; enviable dressing room closet. Expect awe-inspired gasps at every glance. Elegant & spacious custom-built waterfront on 3.6 private acres in Severn Side Farm, an enclave of private estate homes at the mouth of the Severn, over 6000 sq ft on 3 levels, huge, light drenched great room, walls of water-side windows, open-flow floor plan, professional kitchen, main level bedroom/office w/private bath, screened porch & multiple decks, 90 feet of waterfront, private pier. If you are looking for privacy, look no farther. If you have an affinity to a life on the water, surrounded by nature and wildlife, this is your match! Beautiful waterfront home located on large lot of 2.32 acres in the water community of Herald Harbor! The spacious living room includes large cathedral windows to look out to the Little Round Bay, as well as a gas fireplace. 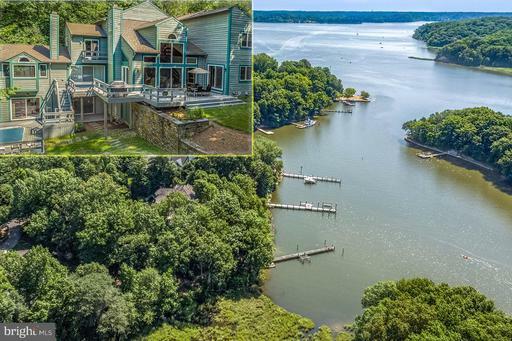 Walk down to the private pier that is equipped with electric, plumbing, boat lift, jet ski lift, with water depths of 8 ft at the end of the pier. Other amenities include a spacious 3-car garage, a lavish master suite with a large walk in closet, his and her vanities, whirlpool bathtub, and huge walk in shower. Main floor office can be converted into a first floor bedroom which also includes built in bookcases and cabinets. The basement includes a full sized bar with dishwasher, ice maker, mini fridge, and wine cooler - a entertainer's dream! 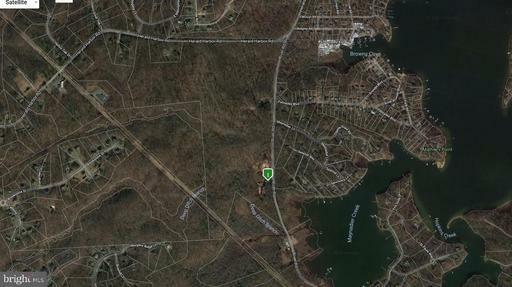 Property was recently appraised at $1,325,000! 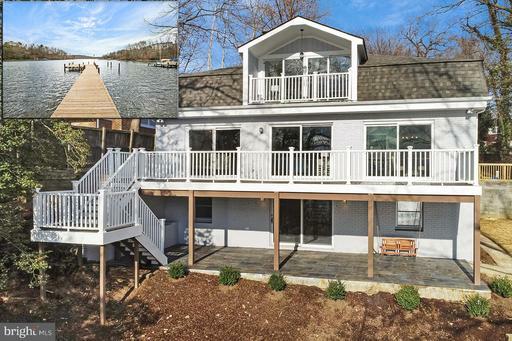 507 Palisades Blvd is a gorgeously remodeled waterfront home with stunning Maynadier Creek views. 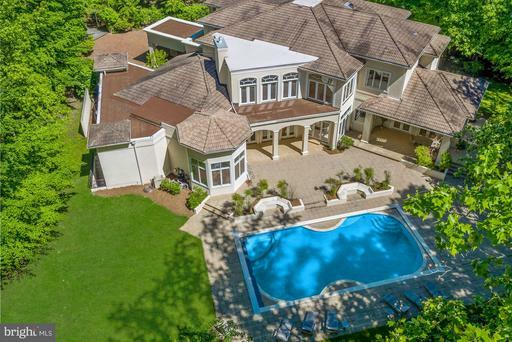 This 5 bedroom 4.5 bath home is situated on over a half acre professionally landscaped lot and has a new private deep-water pier, a gazebo right at the water~s edge, two waterside decks, and a custom stone paver patio. The Palisade Park community is conveniently located just minutes to major commute routes, shopping, restaurants, and more. As you step through the beautiful wood entrance door into the foyer you are immediately greeted by the striking hardwood floors, wood-beam architectural details, spectacular finishes including upgraded lighting, and sweeping waterviews.~ The gourmet chef~s kitchen has an exceptional backsplash with gold accent, new stainless-steel appliances, a breakfast bar with granite waterfall top and prep space, walk-in pantry, and amazing white quartz countertops. There is an eat-in space that opens to the living room with shiplap surround wood-burning fireplace and to the dining area; both areas have amazing views and access to the waterside deck. There~s also a bedroom and a full bathroom with updated fixtures, vanity, tub & shower and lighting.Upstairs, the~Master bedroom suite has wood barn-door style doors that open to a true waterfront oasis.~ The spacious suite has a wall of glass that opens to a private deck, two walk-in closets and a luxurious master bathroom.~ Complete with a tiled shower, multiple shower heads, a bench, and a large soaking tub, a double sink vanity, gorgeous tiled floors, and a skylight to let in tons of natural light, this luxe bathroom is sure to please.~ The upper level has two additional bedrooms that share a fully updated hall bathroom with excellent neutral finishes.The walk-out lower level has a wood-surround wood-burning double sided fireplace that is truly the focal point of the additional living space.~ Perfect for a family room, game room, or guest living space, the open feel and large space leaves many options for use.~ There is a 5th bedroom on this level with a private en-suite bathroom and a private access door to outside.~ Also on this level is a half bath. The thoughtfulness and tasteful updates and upgrades are apparent throughout and are truly magnificent.~ Owner even installed a new well, two new AC systems with Nest system, new decking, new lighting throughout and a new patio swing. This one is a must see! PLEASE NOTE: Some photos may be virtually staged. Listed by Charlie B Buckley of Long & Foster Real Estate, Inc.
Williamsburg Style Home w/open floor plan + 4 FP*3-story foyer*Expansive living room w/high beam ceilings*Updated Gourmet Kitchen w/high-end appl. 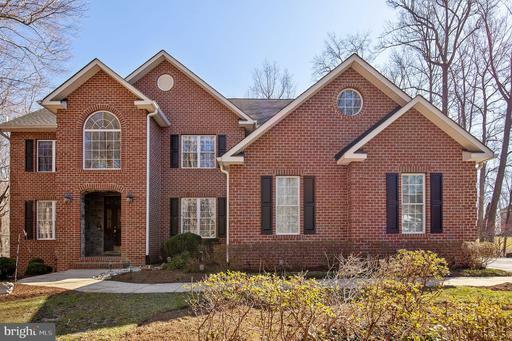 & built-in window seating* FR located off the kitchen w/wet bar & surround sound*Library w/custom built-in cabinetry*Stately master suite w/terrace overlooking manicured grounds w/sprinkler & pool w/waterfall*home wired 4 generator*water privilege comm. PRICED TO SELL! SAILORS -- DEEP WATER PIER has 8 ft WATER DEPTH! 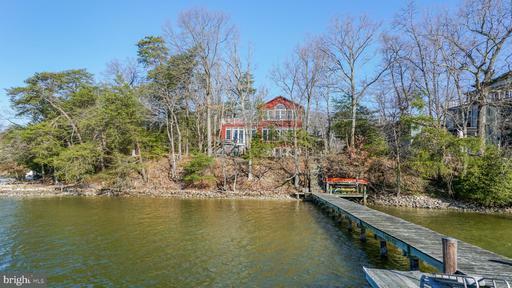 5,000 SF contemporary 4-bedroom home in desirable Maynadier offers protected dockage for your boats yet there's easy Chesapeake Bay access. Dramatic architecture includes two-story wall of windows & multiple decks. 3 finished levels. Super private setting and good commute location. A WATERFRONT BEST BUY! Be sure to take the Tour!